Multi-tasking has become a way of life, but sometimes your PC just can't keep up with everything you want to do on it at the same time. 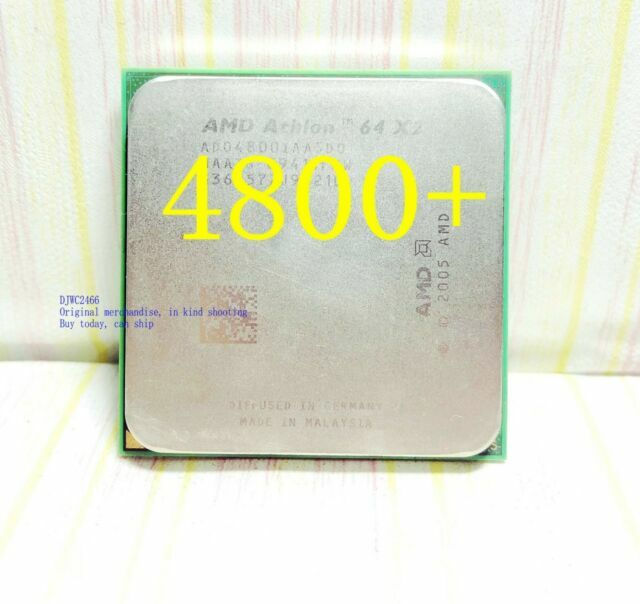 The AMD Athlon 64 X2 Dual-Core processor enables true multitasking - taking computing to an all new level. Dual-Core technology is like having two processors working together, each one taking care of different applications. So now you can simultaneously burn a CD, check e-mail, edit a digital photo, and run your virus protection - all without slowing down your computer.To protect your computer you've installed all the latest virus protection and firewall software. The result? Your PC is safer but slower. Upgrade to a computer powered by the AMD Athlon 64 X2 Dual-Core processor - now you can run protection programs in the background while a second runs the applications you want to work on - making computing fast again. I have several of theseCPU's, I think they are very fast, And reliable. I would use the CPU for my desk top, and I think it is fast and never any troubles, very reliable . I built my last 2 computers using these CPU's very easy to install, fast as any I have used before . I would recommend these to any one that needs a very good and fast CPU. I do like AMD over any other brands. It works perfectly! I was able to get my PC back up and running in minutes. Plus, when your package arrives, you can tell a human was behind the product, not a factory. Love it! FOR A USED PROCESSOR, IT WORKS, NO PROUBLEM.